Stephen Colbert confided a few weeks ago that, with the dizzying—not to say nauseating—pace of the scandals, bigotry, incompetence, and multifarious malfeasance emanating from the Trump administration (and family), the writers of The Late Show With Stephen Colbert are usually writing and rewriting right until taping. (He’s said that some late-breaking events have even caused the show to scrap an opening monologue entirely.) So, on a day when former FBI director James Comey testified in front of the Senate intelligence committee that, among other things, Donald Trump fired him explicitly because of the ongoing investigation into Russian election interference (and increasingly plain evidence of Trump campaign collusion therewith), Colbert spent his opening monologue taking shots from downtown. Pee tape? Allegedly. Trump is a liar? Well, yeah. Putin and the Russian government were behind the election hack? Duh. John McCain should really call it a career. Apparently. 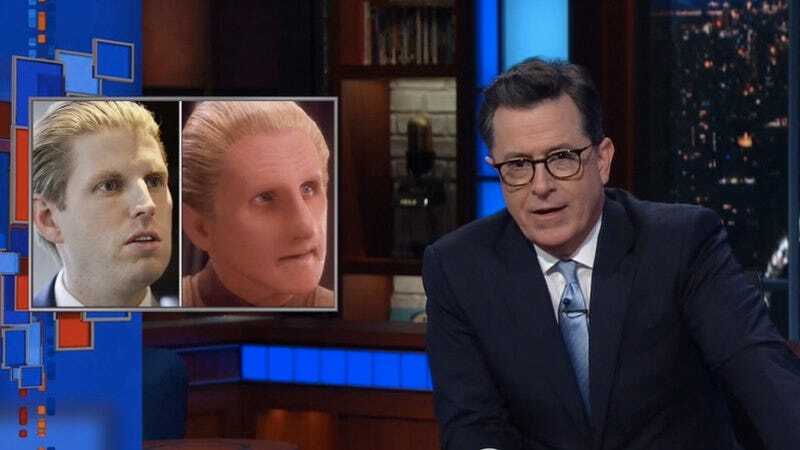 But Colbert wasn’t about to let the Comey testimony take up all his time and attention, devoting his desk piece to a recap of the developing scandal of another Trump, this time, “Odo from Deep Space Nine” lookalike (according to Colbert), Eric Trump. Quoting a recent story by Forbes’ Dan Alexander about the paper trail indicating that E. Trump’s golf charity diverted more than a million dollars from the—wait for it—little kids with cancer it was intended to help, Colbert held forth with that combination of glee and disgust that most late night have in their back pockets by this point when reporting on yet another Trump family debacle coming to light. Citing that daddy Donald reportedly told organizers, “I don’t care if it’s my son or not, everybody gets billed,” when he found out Eric was allowing the cancer charity to use Trump golf courses for free, Colbert—apparently deciding that inner ugliness (allegedly) merits a discussion of outer unpleasantness—kept on dunking, flashing side-by-side pictures of Eric and supposed doppelgangers “Voldemort with hair,” “the skeleton child from The Nightmare Before Christmas,” and an unholy amalgamation of Beavis and Butthead. Unfair? Allegedly.